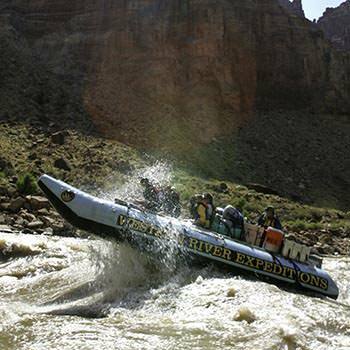 Often described by the guides who drive them as "the Corvette of the Colorado River", the Western "Snout-Rig" (it's technical appellation) is nimble and quick between the waves, and fast on the flat water in between. Certainly lacking in heavy duty "trunk space" compared to the much larger J-Rig raft, the snout rig raft makes the same 100 mile journey through the canyon in half the time - while uncompromising in camp comforts and menu. The only down side is not seeing more than one sunset and sunrise from the depths of Canyonlands National Park.